In a 2007 speech at a financiers' symposium, he said, "In today’s regulatory environment, it's virtually impossible to violate rules. And this is something that the public really doesn't understand. And if you read things in the newspaper and you see somebody, you know, violate a rule, you say, well, you know, they're always doing this. But it's impossible for a violation to go undetected, certainly not for a considerable period of time." 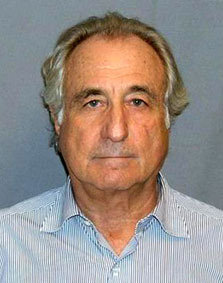 According to court documents released after his 2008 arrest for fraud, Madoff told investigators that his money management business was "basically, a giant Ponzi scheme" which swindled charities, individual investors, pension funds, and European banks of up to $50 billion. Madoff's victims included actor Kevin Bacon, retired baseball great Sandy Koufax, actor John Malkovich, and Nobel Peace Prize winner Elie Wiesel.